ARRL Headquarters Will Be Closed on November 26-27: ARRL Headquarters will be closed for the Thanksgiving holiday on Thursday and Friday, November 26-27. The ARRL Letter will not be published on Thanksgiving Day, Thursday, November 26, and there will be no edition of ARRL Audio News on Friday, November 27. In addition, there will be no W1AW bulletins or code practice on those days. We wish all our members a safe and enjoyable holiday! The Amateur Radio Parity Act S. 1685 took an essential step forward on November 18, when the US Senate Committee on Commerce, Science, and Transportation voted to report the bill favorably and without amendment. It was one of a half-dozen bills that were approved by the committee in a brief markup session. S. 1685 was approved on a voice vote, with two Senators -- Bill Nelson (D-FL) and Brian Schatz (D-HI) -- asked to be recorded as voting "no." "Our work is not finished on the Senate side of Capitol Hill, although this is a huge step forward," said ARRL President Kay Craigie, N3KN. She urged ARRL members to continue to write, call and e-mail their Senators about S. 1685 to build up its support for the future, saying, "We know that members' response to the call for a communications blast last week made all the difference for some Senators on the committee." S. 1685 picked up another Senate cosponsor on November 18, when Senator Jerry Moran (R-KS), who sits on the Commerce Committee, signed aboard the bill. "ARRL members in Kansas should contact his office to say thanks," President Craigie said. "Having an additional cosponsor who's on the Committee is especially good news." On hand to observe the Committee mark-up session were ARRL Hudson Division Director Mike Lisenco, N2YBB; ARRL CEO David Sumner, K1ZZ, and ARRL General Counsel Chris Imlay, W3KD. President Craigie encouraged ARRL members in Florida and Hawaii to keep contacting Senators Schatz and Nelson, urging them to change their minds about the legislation. "Don't be harsh or angry," she advised. "Keep it factual and courteous, and don't give up." (L-R) ARRL General Counsel Chris Imlay, W3KD; Hudson Division Director Mike Lisenco, N2YBB, and ARRL CEO David Sumner, K1ZZ, were on hand to observe the Senate committee markup session on November 18. On November 5, US Senator Al Franken (D-MN) signed on as the second cosponsor of S. 1685. That legislation and its US House twin, H.R. 1301, call on the FCC to extend the limited federal pre-emption of PRB-1 to cover private land-use restrictions such as deed covenants, conditions, and restrictions (CC&Rs). The Amateur Radio Parity Act of 2015 page on the ARRL website has more information on how you can become involved. Read more. The Plenary Meeting of the 2015 World Radiocommunication Conference (WRC-15) in Geneva has approved an allocation of 5351.5-5366.5 kHz to the Amateur Service on a secondary basis, with a power limit of 15 W effective isotropic radiated power (EIRP). The November 18 decision on Agenda Item 1.4 was adopted on two back-to-back readings. Some Region 2 countries -- but not the US -- will be permitted up to 25 W EIRP. With this action, and despite conditions that are more restrictive than had been hoped at the start of the Conference, the Amateur Service has obtained its first new global HF allocation since 1979. While the Final Acts of the conference are expected to take effect on January 1, 2017, the new band will not become available to amateurs until their national telecommunications administration amends its rules and licensing conditions. Those administrations that already permit amateurs to operate in the 5 MHz range under certain conditions and on a not-to-interfere basis, including the FCC, will be considering whether, how, and when to modify those arrangements in light of the international allocation. The International Amateur Radio Union (IARU) team is doing what it can to influence the agenda for WRC-19. The agenda could include addressing amateur spectrum requirements in the 50-54 MHz band in Region 1, which could lead to at least partial harmonization of the 6 meter band worldwide. A proposed agenda item to align the 160 meter allocation in Region 1 with the rest of the world is no longer under active consideration. The WRC-19 agenda will also likely pose spectrum defense challenges, including possible consideration of the 420-450 MHz band to accommodate a new allocation to the space operations service for satellites in non-geostationary orbit that are described as "small satellites" or "satellites with short duration missions." One or more bands above 10 GHz may be up for consideration for 5G smartphone use. The bounds of these potential defensive items, however, are still under discussion by the conference and will not be settled until its final week. The IARU team continues to monitor several other WRC-15 items that appear to be headed toward acceptable conclusions. WRC-15 continues through the signing of the Final Acts on November 27. The FCC Universal Licensing System (ULS) electronic batch filing (EBF) system was working for a brief window of time yesterday after being down since Friday November 13. Some files were processed through the system Wednesday, but the FCC is having a problem processing all VEC license and examination session files today. ARRL VEC Manager Maria Somma, AB1FM, said her office again had to alert the FCC IT staff, which are said to be looking into the issue but did not estimate how long the system would be down. Somma said it was the third time the EBF system has gone down since late September, when the FCC said a process had stopped running on an FCC server. The FCC doesn't have a long term fix in place yet and it appears the same issue is happening again with more frequency. The amateur community should expect delays in exam license processing until the FCC can get this resolved. The FCC apologies for the continued inconvenience this is causing the community. "We transmit the exam sessions to FCC as soon as possible, which is usually 24 to 48 hours from the day received in our office," Somma said. "We make every effort to process each session quickly and efficiently while following FCC rules. Unless there is missing candidate information or paperwork, we normally aim to send the session to the FCC within a few days, because most of the VEC staff understands what it feels like to wait for your call sign to be issued." Somma expressed the hope that applicants and VEs will be understanding and patient while the FCC resolves the problem. At the request of the FCC, the ARRL on November 13 filed supplemental comments urging the Commission to continue to make available via the Universal Licensing System (ULS) historical Amateur Radio license information not associated with a current licensee or a pending application. The League filed its initial comments in the proceeding, WT Docket 15-81, last June. In its earlier comments, the ARRL argued that historical license data not associated with a current license is a primary means for volunteer examiner coordinators (VECs) to research the validity of exam credit on the basis of a license once held by the candidate. ARRL General Counsel Chris Imlay, W3KD, who filed the supplemental comments on November 13, said the Commission now wanted to know how many applicants were taking advantage of lifetime examination credit, which went into effect in the summer of 2014. ARRL told the FCC that its VEC currently transmits an average of five applications with expired license credits each week, and has handled some 300 such applications since July 2014. The W5YI VEC told ARRL that it relies heavily on historical license information too. ARRL argued that the number could grow, as word of the expanded opportunity for exam element credit continues to spread. "The Commission, having obligated VECs to validate claims of former licensee status and the data associated therewith cannot fairly take away a key resource for objectively evaluating the validity of applicants' claims and documentation," the League said in its supplemental comments. "To do so decreases substantially the ability of VECs to maintain the historically high degree of integrity of the Amateur Radio licensing process. Since the Commission clearly has no intention of assuming any of the burden of the validation process -- and is ill equipped to do so in any case -- the proposal is both unfair and illogical." ARRL said that researching expired license credit is just one of several instances in which VECs might need to access historical license data. Other possibilities, the League said, could include using historical data to validate a candidate's identification, and to research exam credit for pre-1987 Technician licenses. The League concluded by again asking the FCC to continue to make available historical license data at least to VECs, if not the general public. If you missed working one of the two stations handing out the super-rare Northern Territories multiplier in the CW weekend of the 2015 ARRL November Sweepstakes, you may have better luck during the phone event, November 21-23. VY1AAA logged 335 contacts in 73 ARRL/RAC sections during the CW event. Hal Offutt, W1NN, and J Allen, VY1JA, operated VY1AAA from VY1JA, near Whitehorse, Yukon Territory. Offutt operated remotely from within the US, while Allen operated locally. VY1AAA spent 18 hours battling rough conditions during the CW weekend in the multioperator, high-power category, logging the lion's share of its contacts on 20 meters. "Knowing how popular and needed the NT mult is, I hoped to put at least 1000 contacts in the log and enjoy some fun pileups all weekend," Offutt said in a post on 3830scores.com. "I was not counting on something called a coronal mass ejection (CME)." The CME threw the proverbial monkey wrench into the plans of many operators in the US and Canada, although a lot of other stations reported favorable conditions. "Friday night J sent some pictures of the aurora that was visible from his QTH in Whitehorse, and it began to sink in that I might not have those pileups I had been hoping for," Offutt said. He reported missing the NH, RI, SFL, PR, QC, ONE, GTA, MB, AB, and NL multipliers. Hal Offutt, W1NN, has operated VY1AAA from the US and Japan. VY1AAA is the call sign of the Yukon CanAm Contest Club (YCACC), established by Allen and Gerry Hull, W1VE. Its primary purpose is to support Allen in making the Yukon Territory multiplier available in major contests. Hull will helm VY1AAA for the SSB event, hanging out near band edges and following the MUF during the day. At his gray line, he'll shift to 40 meters, and will be on 40 early in the morning for the US East Coast too. John Boudreau, VE8EV, in Inuvik, Northwest Territories, was planning an all-out effort this year, but yielded to poor conditions and to the VY1AAA operation, and only spent an hour on the air. "When conditions picked up a bit Sunday afternoon, I ran for an hour just to prove I could do it," he said in a 3830 post. "I'm expecting much better conditions...for SS Phone. See you then!" At the other end of Canada, Gus Samuelson, VO1MP, in the also-rare NL multiplier, said, "Conditions [were] about as poor as I have ever heard for Sweeps." He missed NNY, ID, NE, WY, NT, and PAC. Roughly one-half of his contacts were on 15 meters. The phone weekend of the 2015 ARRL November Sweepstakes gets under way at 2100 UTC on Saturday, November 21, and runs through 0259 UTC on Monday, November 23. The 2015 ARRL November Sweepstakes operating guide is available on the ARRL website. In cooperation with ARRL, CQmaps has introduced a 2016 National Parks on the Air (NPOTA) map. The full-color map includes all NPOTA units within the US, including Alaska, Hawaii, Puerto Rico, US Virgin Islands, Guam, Saipan, and American Samoa. All sites are clearly labeled and include the park name along with the ARRL park designator. 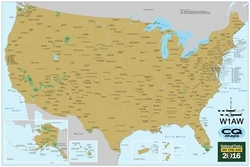 Each 24 × 36 inch map is offered in either a laminated heavyweight paper or DuPont Tyvek. The NPOTA laminated map is well suited for using a dry-erase marker to check off your progress in chasing the parks. The map is personalized with your Amateur Radio call sign. The price is $25, including US shipping. Add $10 for international orders. Fox-1A (AO-85) has been formally commissioned and turned over to AMSAT Operations, which is now responsible for the scheduling and modes. Fox-1A is AMSAT-NA's first CubeSat. Many new techniques are incorporated, and lessons will be learned, as with any new 'product,'" said AMSAT Vice President-Engineering Jerry Buxton, N0JY. "We will incorporate changes from what we learn in each launch, to the extent possible, in subsequent Fox-1 CubeSats. To our members, we want to say that the Fox Team is very proud and pleased that our first CubeSat is very successful and hopefully will be for some time." The Fox-1 Project is a series of CubeSats. A total of five will be built and flown. Launches already have been scheduled for three more, and a new NASA CubeSat Launch Initiative proposal will be submitted for the fifth launch. The Fox Team noted that an apparent lack of receiver sensitivity and difficulty in turning or holding on the repeater with the 67 Hz CTCSS tone are probably the most notable observations about AO-85. A new contest to promote activity between stations in the UK and in Ireland (UK/EI) and the rest of the world debuts with an SSB event in December 5-6 and a CW event January 23-24. Both get under way at 1200 on Saturday and end 24 hours later. The United Kingdom and Ireland Contest Club (UKEICC) is sponsoring the new contest. "All UK and EI contesters, including those with modest stations and antennas, will experience the fun of being a multiplier in a worldwide contest," the announcement said. While the eventual goal is to have UK/EI stations work the rest of the world, all entrants may work all other entrants for points and multipliers. "For the first year or two we have to take into account that UK/EI participation may take time to build up and that there are long periods when DX stations cannot work UK/EI stations, because there is no propagation," the announcement pointed out. "Accordingly, we are initially allowing DX-to-DX contacts, which will make the contest more interesting for DX stations." Full information is on the UK/EI DX Contest web page. Read more. As you browse for great deals online this Black Friday and Cyber Monday, we invite you to shop at AmazonSmile, choosing the ARRL as your charity of choice. With every qualifying purchase you make through AmazonSmile, Amazon will make a contribution to ARRL. When you shop at AmazonSmile, you will be helping the League to extend its reach in public service, advocacy, education, technology, and membership. Bookmark the link and support ARRL every time you shop. ARRL wishes you a wonderful Thanksgiving holiday and hopes you'll remember us when you shop on Amazon this season. AmazonSmile allows shoppers to enjoy the same wide selection of products, low prices, and convenient shopping features as on Amazon.com. When customers shop on AmazonSmile, the AmazonSmile Foundation will donate 0.5 percent of the price of eligible purchases to the charitable organizations selected by customers. 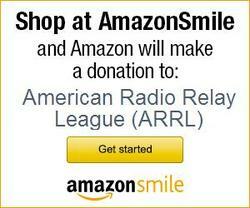 As a 501(c)(3) organization, ARRL -- the national association for Amateur Radio® is a registered charity of AmazonSmile. The eight-member international team now activating VK9WA from Willis Island November 14-23 reports the DXpedition is going smoothly for the most part. VK9WA has generated substantial pileups over the past week and had logged some 24,000 contacts as of November 18. The 160 meter receiving antenna has been repaired, and the team said that its new frequency on that band will be 1827 kHz. The team is operating from the 4-acre Middle Cay, some 280 miles off the eastern coast of Australia. Operation is on all bands, 160-10 meters, SSB, CW, and RTTY. The team has begun running RTTY on 10.142 MHz. "Our primary focus will be providing new contacts with this highly demanded, rarely activated entity with an emphasis on difficult paths -- primarily US East Coast, Europe, and Africa," the DXpedition website states. The DXpedition team will be on the island until November 22 and plans to tear down all but two stations the afternoon prior to leaving. Two stations will run overnight before departure. VK9WA has been arriving via long path to the US on 17 and 20 and via short path on 15, 12, and 10. They are using verticals plus one two-element Yagi. Signals into South America and southern Africa "have not been good," the team reported this week. Willis Island, which has not had a significant activation since 2008, is number #32 on the ClubLog Most Wanted DXCC list. The weather there, where it is spring, is reported to be "extremely hot." ClubLog statistics show fairly even contact percentages for Asia, Europe, and North America. A reminder to those hoping to work VK9WA (or any other major DXpedition): Do not call the DX station on its frequency; you must operate split. Pay attention to the operator's instructions. ARRL Oregon Section Manager Everett Curry, W6ABM, has told the Section's Amateur Radio Emergency Service Emergency Coordinators that Oregon ARES/RACES will continue to work with the Oregon Office of Emergency Management (OOEM). Curry's statement comes nearly a week after the OOEM severed its working relationship with Oregon Section Emergency Coordinator Vince Van Der Hyde, K7VV. Van Der Hyde remains as SEC. "Nothing that OOEM has done alters your commitment to your served agency -- in most cases your county -- and the commitments of Oregon ARES/RACES to work with you in meeting the commitments made to your county," Curry told the ECs. "I will work with OOEM for the present." State Communications officer and Oregon RACES Officer Terry Pietras, W7JOC, wrote Van Der Hyde on November 9, informing him that OOEM had decided to sever the relationship between Van Der Hyde and the OEM Amateur Radio (ARES) Unit. Pietras cited Van Der Hyde's decision not to participate in a November 12 OOEM drill to test RACES emergency communications capabilities and operations. In a November 16 joint OOEM/ARRL Oregon Section statement, the OOEM stressed that its relationship with Oregon ARES/RACES continues. "We...are committed to work with and develop this relationship to enhance emergency communications capabilities throughout Oregon," said the statement, signed by Curry and OOEM Manager, Operations and Preparedness Section Matthew T. Marheine. Curry was scheduled to meet with Marheine this week. "It is my expectation that we will achieve the mutual and respectful working relationship that we desire," he said. He said he hopes to appoint an Emergency Coordinator for the OOEM Amateur Radio Unit soon. Idiom Press of Merlin, Oregon, has announced the sale of its assets to Ham Supply of Elizabeth, Colorado. Owned by Wayne Ordakowski, N0UN, Ham Supply is a new business formed to manufacture and distribute the products previously offered by Idiom Press, as well as other new Amateur Radio products. Ham Supply will honor warranties for existing Idiom Press products, and once production is resumed, Ham Supply will honor all existing orders placed with Idiom Press after reconfirming them with the customer. Ordakowski has said he intends to have the new business in full operation by the first week of January 2016, although some previously placed orders may ship earlier. Idiom Press published The Complete DXer by Bob Locher, W9KNI, who started the business before turning it over to his son Rob, W7GH, who is returning to the computer programming field. Past Pacific Division Director Brad Wyatt, K6WR. Life Member, Wyatt served as the Pacific Division Director from 1994 until 2000, when he decided not to run for another term. He previously served as Vice Director of the Pacific Division from 1992 until 1994. Wyatt retired from IBM in 1984. He received bachelor's and master's (MBA) degrees from Stanford University. Wyatt was a past president of the Los Gatos Kiwanis Club. In November 2001, Wyatt's article, "Remote Controlled HF Operation over the Internet," appeared in QST. A year later, Wyatt and co-authors Stan Schretter, W4MQ, and Keith Lamonica, W7DXX, won the QST Cover Plaque Award for their collaboration on the article, "A Ham Radio Public Utility HF Station." 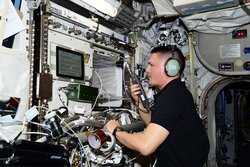 Astronaut Kjell Lindgren, KO5MOS, Tweets Anniversary Greetings to ARISS: Astronaut Kjell Lindgren, KO5MOS, has tweeted greetings to the Amateur Radio on the International Space Station (ARISS) program on the 15th anniversary of the first Amateur Radio contacts between the ISS and Earth. "First QSOs conducted from the ISS ham radio station 15 years this weekend. Happy Anniversary ARISS! 73!" Lindgren tweeted on November 15. ARISS International Chair Frank Bauer, KA3HDO, noted the auspicious occasion on November 13, in a post to the AMSAT-BB. "15 years ago today the ARISS team inaugurated the ham station on ISS with the first set of QSOs with the crew," Bauer recounted. "These contacts were conducted on this date in Moscow, Russia; Greenbelt, Maryland, and Houston, Texas. Lou McFadin, W5DID, and I were on the mic at the Greenbelt, Maryland location." That occasion marked the first use of the NA1SS call sign from space. Lindgren, who arrived at the ISS in July, will return to Earth in late December. During his duty tour, he has participated in several ARISS school contacts. Fall 2015 Issue of Radio Waves is Now Available: The fall 2015 edition of Radio Waves is now available via the ARRL website. This issue includes such articles as "Using Sensors to Explore Terraforming," "STEM School and Academy ARC Builds Repeater," and "Community College's DIY Spirit Shines for ARISS Contact." Published quarterly by ARRL Education Services, the fall 2015 edition also looks at how ham radio can help Boy Scouts to earn the Radio merit badge; news, ideas, and support for instructors; ham radio instruction for people with disabilities, and the evolution of a licensing class. Current and back issues of Radio Waves are available on the ARRL website. Radio Waves is available free as a PDF. Solar activity declined again this week, with average daily sunspot numbers for the November 12-18 reporting week at 43.3, down from 72.3 during the previous seven days. Average daily solar flux was 105.5, down from 109.4. Geomagnetic A indices were down, which is generally a good thing for HF propagation. The average daily planetary A index slipped from 25 to 11 and average daily mid-latitude A index from 19 to 9. All four of these average A indexes being whole integers is an odd occurrence. Predicted solar flux is 108, 106, 104, and 105 on November 19-22, 103 on November 23-24, then 100, 105, and 110 on November 25-27, 115 on November 28-29, 120 on November 30 and December 1, 115 on December 2, 110 on December 3-4, and 105 on December 5-14. Flux values then drop to a low of 95 on December 17-18, then rise back to 120 on December 27-28. Predicted planetary A index is 18 and 10 on November 19-20, 8 on November 21-22, 5 on November 23-25, 8 and 5 on November 26-27, 8 on November 28-29, 25 in November 30 and December 1, then 15, 8, 5, 12, 20, and 25 on December 2-7. Sunspot numbers for November 12 through 18 were 29, 50, 48, 63, 44, 33, and 36, with a mean of 43.3. 10.7 cm flux was 103.5, 102.9, 106.3, 105.8, 105.6, 107.1, and 107.6, with a mean of 105.5. Estimated planetary A indices were 5, 14, 10, 9, 14, 8, and 17, with a mean of 11. Estimated mid-latitude A indices were 4, 12, 10, 7, 9, 7, and 14, with a mean of 9. Please send your reports and observations to k7ra@arrl.net.